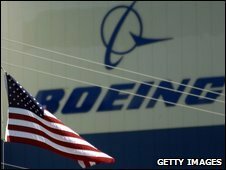 Boeing says it will cut 10,000 jobs this year, about 6% of its total workforce, in response to the global economic crisis. That includes the 4,500 job cuts announced by the commercial aircraft division earlier this month. Boeing made a loss in the final three months of 2008 after a strike by workers disrupted aircraft deliveries. The aerospace firm made a loss of $56m (£39m) in the quarter, compared with a profit of $1.03bn a year ago. The loss was caused by a 58-day strike by Boeing's machinists' union and charges related to delays on its redesigned 747 freighter aircraft. The strike by assembly workers prevented delivery of about 70 Boeing planes. Boeing has been losing ground to rival European planemaker Airbus, which delivered and received more orders for planes than Boeing last year. Airlines are expected to cut spending on new jets as the economic downturn hits demand for air travel. "The global economy continues to weaken, and it's affecting air traffic and financing," said Jim McNerney, Boeing chief executive. "We must prepare the company, including being more aggressive in terms of productivity." He said the 10,000 cuts would be made "through attrition, retirement and layoffs". Boeing employs about 600 people in the UK. The company has not revealed where the cuts will be made.